Capt. McGrew Rice was outside of Kahaluu on the Big Island (Kona side) in 1,000 fathoms of water when a 1058-lb blue marlin attacked a green Eric Koya "Poi Dog" lure with red eyes and a blue vinyl skirt on the short corner. Kai Rizzuto, age 16, manhandled the monster marlin and it was boatside in a half hour's time. 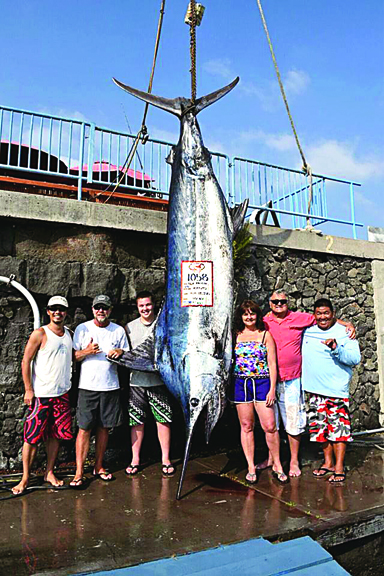 The crew was unable to revive the marlin and the IHU NUI returned to port with its third 1,000-plus-lb blue marlin. Kai's grandfather, Jim Rizzuto, is a well-known author of many fishing books and magazine articles. Jim was also aboard the IHU NUI and photographed his grandson in action.